Nothing quite brings the feeling of spring like a bouquet of fresh, fragrant flowers in your home. From grand arrangements to a simple rose, we can assist with all of your floral needs. Check out these tips on how you can get that beautiful bouquet to last a little longer. When buying flowers make sure that they are at the optimum condition. Look for flowers where the bud shows some color. 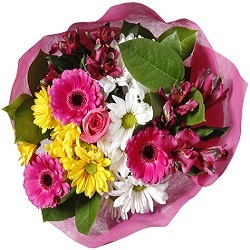 Flowers should be carefully packed when they are taken home, as this prevents damage to flowers or stems. Make sure the vase is clean. Cut flowers will last longer if you use the provided flower food. Make sure you use the correct amount. If you are not sure, ask your florist. Before arranging the flowers in a vase, cut off approximately an inch from each stem at an angle. If you have roses, cut them with the stems underwater. Stems should never be broken off or flattened – not even “woody” stems. Scraping off the bark will also shorten the flower life. Remove all leaves on the lower portion of the stems. Leaves should never be covered with water as this will decrease the longevity of the flowers. Regularly top off the vase with clean water. Keep out of direct sunlight, keep away from heat and breezes. Keep away from fruit. At night, flowers prefer to be kept cool and benefit from a lower thermostat setting. Daffodils can be deadly to other flowers because they secrete a poison in the water. After trimming, leave them on their own for a whole day and do not cut again before combining them with other flowers. However, a special cut flower food is available for daffodils and this enables them to be mixed with other cut flowers immediately. If your flowers start to droop, cut off at least an inch underwater, to prolong their life. Remember, flowers are thirsty!